Some less informed whiskey purists savor their cherished, brown elixir pretty much exclusively with a side-helping of smug. This means any other additives are strictly anathema to the seemingly centuries-old doctrine governing whiskey consumption. It's just that scientists are now chipping away at these rote notions of the cocktail lounge, with new research that proves many of the old whiskey pros right: the drink tastes better after adding a splash of water. Weekend whiskey warriors, prepare to start frothing. A study published in the journal Scientific Reports finds diluting the beverage with some water actually increases the preponderance of a chemical called guaiacol, which is responsible for giving the drink the flavor notes you know and love. A team of researchers led by Björn Karlsson and Ran Friedman at the Linnaeus University Center for Biomaterials Chemistry in Sweden, subjected mixtures of water and ethanol to various computer simulations, finding that guaiacol has a stronger presence in mixtures with less alcohol. As the researchers explain, in mixtures that contained 45 vol-% of ethanol, guaiacol rose to the top of the mixture, giving the drink a more robust and traditional whiskey tang. 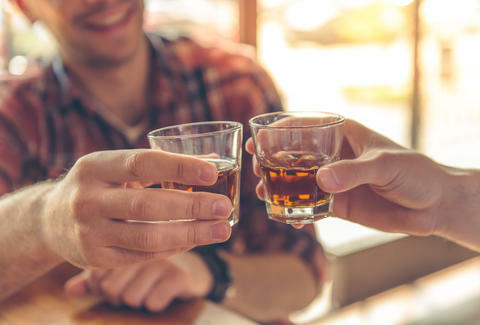 In less diluted mixtures containing 59 vol-% of ethanol, researchers found that "guaiacol is increasingly surrounded by ethanol molecules and is driven to the bulk" of the drink, where the flavor can often spread out and become muddled. Of course, this only means adding a small dash of water, not a full glass or a fistful of ice cubes, will augment your whiskey experience. Which is to say that your sanctimonious liquor pretensions are all for nought, as proven by science. So savor the flavor of a whiskey neat, but just know that a dash of water might go a longer way than you previously thought.